Given that Japan's cuisine is built on seafood and that there is a fishing village located roughly every four kilometers along a coastline that is one of the longest in the world, it is more than a little surprising that there are not many great local seafood restaurants in the country. Nearly all of the best seafood restaurants are in Japan's big cities. But even these can usually only boast of seafood delivered the day before, and many of them rely on farmed seafood. Locally, the typical options are shokudo, or mom-and-pop diners, izakaya, or pubs, and ryokan, or inns that offer multi-course meals included in the price of the room. While some of these places serve fresh, wild-caught seafood prepared in a satisfying home-style manner, the seafood is usually limited in terms of type and preparation. Often it is simply fried. Or the seafood may make an appearance only as a dainty portion embedded in a procession of dishes in an elaborate kaiseki meal. 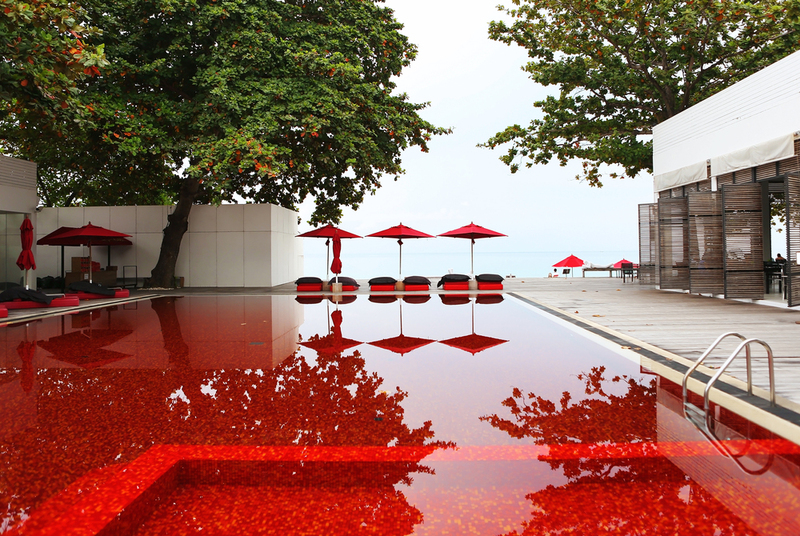 Opened in April this year, Wadatsumi, which means Palace of the Sea Gods, is different. Located in the center of the historic fishing village of Ine, the restaurant serves only seafood—brought in from the sea each morning, wild caught according to ages-old sustainable fishing practices, and prepared in a range of well-executed traditional styles that features the seafood front and center in hearty portions—often as the whole fish. Wadatsumi is housed in a new building that has a sleek design and sophisticated atmosphere albeit with an exterior composed to blend into the village’s unique streetscape. 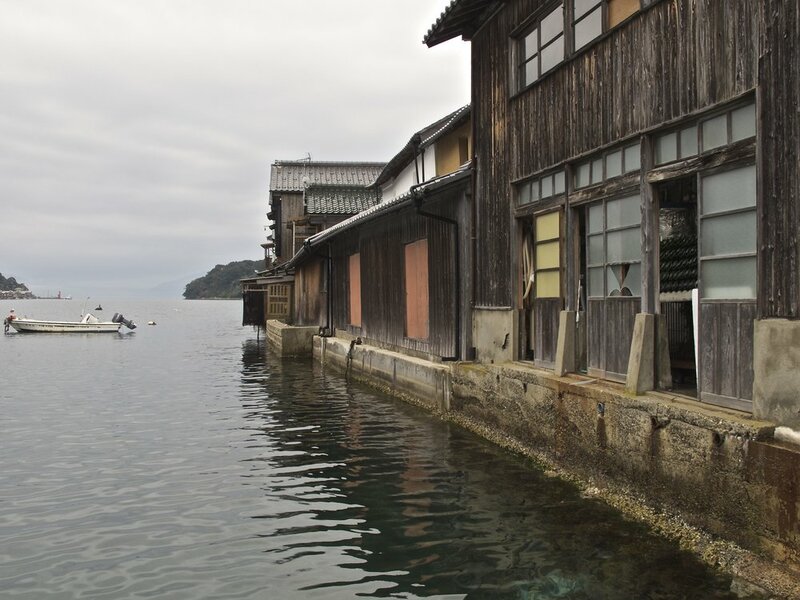 Ine is registered as one of the most beautiful villages in Japan, famous for its boathouse-residences, called funaya, that are perched over the water in a narrow band along the circular shore of Ine Bay. Wadatsumi similarly hugs the water’s edge. 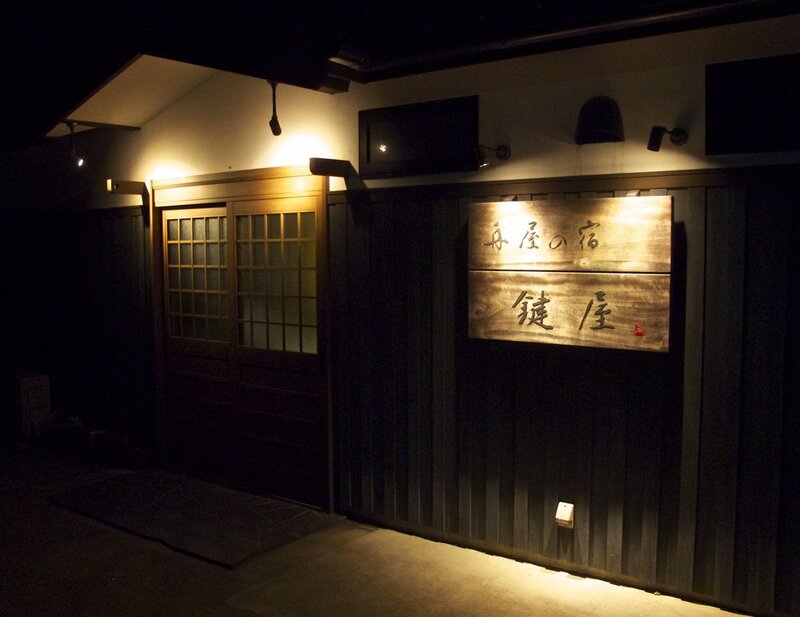 The restaurant bills itself as a kappo seafood and sushi restaurant. Kappo means that diners sit at a counter and watch the chef prepare their meal for them. In addition to seeing their seafood being masterfully cleaned, sliced, cooked, and plated, diners at Wadatsumi may also see the fishermen catch their meal through the broad band of windows that look out onto the bay behind the chef. Straddling the sea and the mountains behind the village, Ine's famous boathouse-residences, called funaya, appear to float on the water. The two men who operate the restaurant, Hiromu Hashimoto and Kengo Kagi, are local fishermen who come from long lines of Ine fisher families. Hiromu cultivates an Ine speciality, iwagaki, or rock oysters, in the middle of the bay just offshore from his home. In addition, he and Kengo get a wide range of fish from the Sea of Japan in the coastal waters beyond the bay’s border, including buri (yellowtail), amadai (tile fish), masu (ocean trout), and shake (salmon). Kengo also brings considerable experience as a chef and restauranteur to the new venture. He went to cooking school in Kyoto, trained at a number of restaurants there including one specializing in fugu puffer fish, and later worked at his father-in-law's sushi restaurant in Ibaraki prefecture before returning with his family to Ine seven years ago. Fishermen and managers of Wadatsumi, Hiromu Hashimoto (left) and Kengo Kagi (right) celebrate the opening of the restaurant in April 2017. Kengo also operates a guesthouse called Kaigya at his family's funaya, or boathouse-residence. Wadatsumi serves some of the highest quality seafood available in Japan, all of which comes locally from the the Sea of Japan, of which Ine Bay is an arm. The sea is a pristine marine environment, benefitting from being almost completely enclosed by Japan, Russia, and Korea. It has minimal man-made and natural pollutants because there is little shipping across the sea, not much industry on its shores, and few rivers that discharge into it. In addition, the sea's deep waters have evolved a high concentration of dissolved oxygen and relatively low salinity, which, together with a nourishing warm current flowing from the south and an enriching cold current coming from the north, produce some of the most plentiful, diverse, and flavorful seafood in the world. Of the more than 1,000 species of fish and 900 species of crustaceans in the sea, many of them are considered the best in their class—buri yellowtail, Tango clams and mussels, Matsuba and Taiza crab, Ine Maguro tuna, and White squid, among numerous others. One of the three richest fishing grounds in the sea, called the Yamatotai Ridge, lies offshore from Ine, and Hiromu and Kengo obtain their seafood from this area in several ways. In addition to line fishing, they practice ama, or set-net fishing. Developed over 500 years ago in Japan, ama set-net fishing is an artisan, low-impact, sustainable way of gathering seafood. The nets are constructed to catch only mature fish and are set at angles to trap only a modest number of those that swim past. In addition, the fish are left in the tent-like net structures to thrive until needed, and only then raised fresh and healthy. Hiromu and Kengo also get seafood for their restaurant from their neighbors, as Ine’s small-scale fishermen operate on a communal basis. 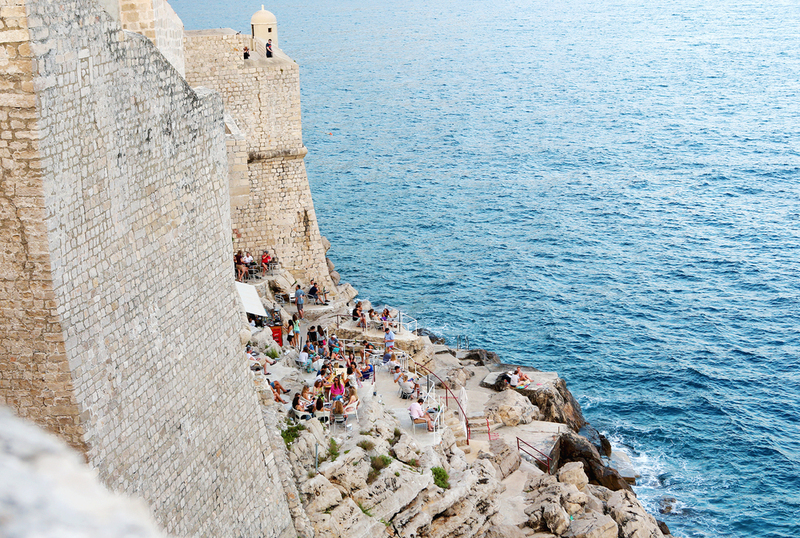 Every morning the fishermen’s daily takings are brought to an informal, open-air market on the beach at the center of Ine called the hamauri. Anyone in the village can get seafood there for free or ¥100 per bucket. The market is a quick four-minute walk around the bend from Wadatsumi, and Kengo can be found there most mornings selecting fish for the restaurant’s daily menu. He judges the fish, as he says, “by whether their eyes are still alive." Kengo Kagi holds up a sawara (Spanish mackerel) at Ine's cooperative fish market, the hamauri, that takes place every morning on the beach at the center of the village. Sawara is considered the best kind of mackerel in Japan because of its size and succulent white flesh. Dinner at Wadatsumi is a set menu of dishes that feature the best catches of the day cooked in a range of styles to showcase their flavors as well as the chef’s talents. The appetizer is usually some kind of pickled or preserved seafood. This is not a clever conceit to all the fresh seafood to come. Ine is famous for its preserved fish, in particular a dish called Ine Saba Heshiko, which is mackerel that has been pickled in rice bran paste. While the appetizer may be some other type of preserved seafood depending on the season, it will be something that is both piquant and richly flavorful to stimulate, as well as begin to satisfy, the appetite and accompany an aperitif. Next comes an assortment of sashimi, delectable slices of raw seafood in a combination of the sweet, rich, buttery tastes of, for example, shrimp, squid, salmon, yellowtail, and tuna and the stronger marine flavors of mackerel, sea bream, trout, and sardines. The sashimi is served with a deeply flavorful, slightly-sweet local soy sauce, Daimaru Shoyu, made in the nearby town of Kyo-Tango. For the richest, fattiest fish, like yellowtail, Kengo recommends a dab of yuzu kosho, a fermented paste made from the zest and juice of yuzu citrus, chiles, and salt. Its powerful flavor punch is a perfect foil to a fish that is essentially the wagyu of the sea. The sashimi course may be followed by another raw seafood course to feature a local specialty that is at the peak of its flavor, such as madai (red sea bream) in spring, iwagaki (rock oyster) in summer, aori ika (bigfin reef squid) in autumn, and buri (yellowtail) in winter. Shirako, or milt, that has been fermented in sweet white miso and then grilled to create a lusciously rich, bright-tasting first course. A seasonal assortment of sashimi, sliced raw fish served with your choice of soy sauce and wasabi, sudachi citrus juice and salt, or yuzu kosho as condiments. The spiked-head shrimp is a local specialty known as aku ebi, or devil shrimp. Plump, briny, milky iwagaki, or rock oyster, is a protein-rich big piece of meat that is usually served sliced and best when eaten raw. Once your palate has been properly introduced to the purest taste of each seafood at its seasonal peak, the chef performs a series of variations that amplify and enrich the seafood's flavors through cooking techniques and the introduction of similar, contrasting, and new flavors. Types of preparations include: braised in a salty-sweet sauce (teriyaki or nitsuke), salt encrusted and grilled (yaki-shio), deep-fried (kara-age) or lightly battered and fried (tempura), poached or steamed (mushi), and marinaded in miso or sake and roasted (yaki). As is typical for a Japanese meal, the last course is rice, pickles, and soup. The rice dish is a medley of onigiri sushi, rice balls topped with raw fish to once again give you the taste of the sea. It is a return to the theme of freshness and pure flavor after a delicious series of variations. The set menu at lunchtime is a scaled-back but still hearty and varied offering that includes small plates of sashimi, grilled and braised fish dishes, chawan-mushi (a steamed seafood and egg custard,) and onigiri sushi, pickles, and soup. 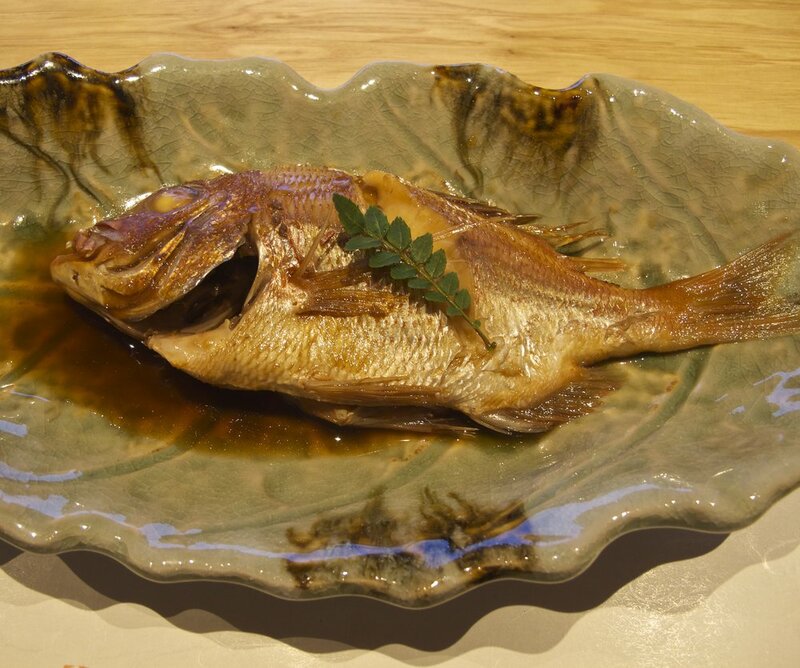 A prized nodoguro, or blackthroat seaperch, prepared nitsuke style, which means the fish has been braised in a sweet, salty, gingery, umami-rich broth to complement the rich yet tender flake of the fish. Being leaner late in the season at the end of spring, Sawara, or Spanish mackerel, has been marinaded in miso and broiled to enrich its flavor. The local waters of the Sea of Japan offer everything, and Wadatsumi's onigiri sushi served at both lunch and dinner includes locally-caught wild shake (salmon), maguro (tuna), and masu (trout) among other tasty morsels. Open from 11:30 to 15:00 for lunch and from 18:00 to 22:00 for dinner. Closed on Wednesdays. The price for the set lunch is ¥3,240, and for the set dinner ¥6,400. Both meals include a dessert and tea or coffee. Although it is possible to walk in on a weekday and get a seat, Wadatsumi is a small restaurant and reservations are recommended. The restaurant is part of the Funaya Biyori complex of buildings, which was sponsored by Ine's local government to create ways for visitors to enjoy and interact with the village. Other spaces include Ine Cafe and a boathouse and exhibition space that showcases Ine's heritage. Ine is designated a Significant Cultural Streetscape by Japan’s Agency of Cultural Affairs and is also a member of The Association of the Most Beautiful Villages of Japan because of the beauty of its environment, cultural traditions and unique way of life, and sustainable way the village uses local resources. 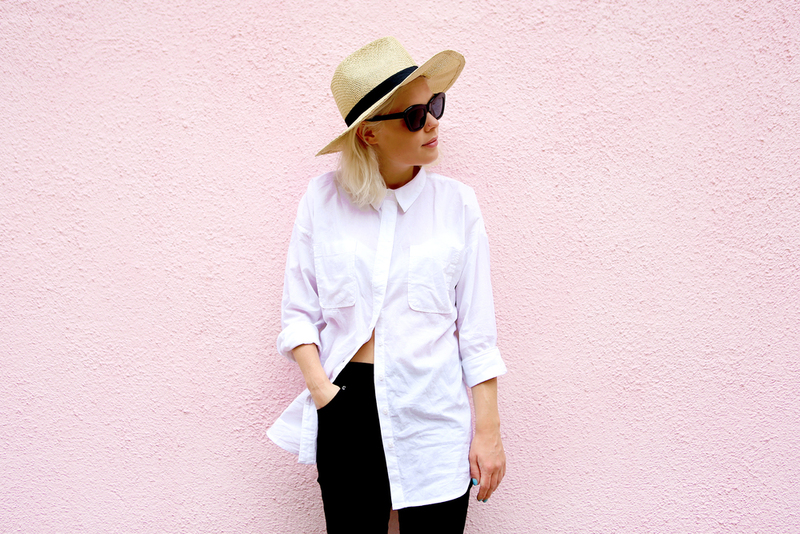 These attributes make Ine a wonderful place to visit. While there are a handful of shops, galleries, cafes, and restaurants, the main purpose should be to explore the village by foot or boat and enjoy the beauty and charms of life lived in harmony with nature. 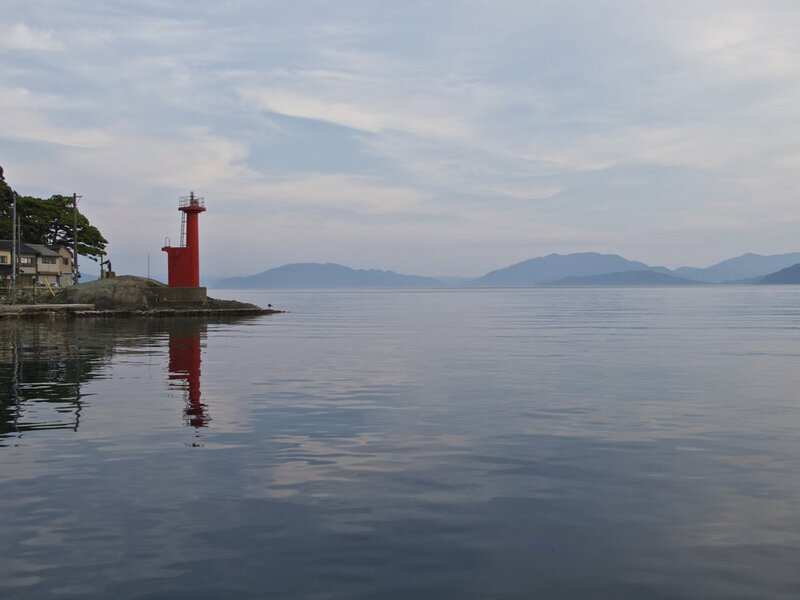 A red lighthouse marks the point where the tranquil mirror-like waters of Ine Bay meet the Sea of Japan. From the towns of Miyazu and Amanohashidate there are buses to Ine from their respective train stations. The journey is just over an hour. From the Ine bus station it is about a 5-minute walk to the restaurant. From April 29 to November 5 it is also possible to go to Ine by ferry boat on Saturdays, Sundays, and holidays. Boats leave from the main piers at Miyazu and Amanohashidate and take about an hour to reach Ine. From Ine's pier it is about a 10-minute walk to the restaurant. If you are staying in Ine you can easily walk to the restaurant. But if you are pressed for time after having enjoyed a cocktail-infused sunset from your inn or would like to create the most sea-memorable evening, you can hire a water taxi to take you to the restaurant. Local fisherman and innkeeper Tsugichika Kura giving an all-clear sign after having dropped guests off for dinner at Wadatsumi. Five of Ine's funaya have been renovated as guesthouses. The typical set-up is two bedrooms upstairs and dining and living areas below including outdoor decks overlooking the bay. Most of the funaya guesthouses book only one group of guests at a time to create privacy and a home-like atmosphere. Two of these funaya guesthouses are operated by fishermen who provide delicious, fresh seafood meals as part of the package and a chance to experience their way of life. This includes sea taxi services, boat tours of the bay, and fishing excurions for additional charges. A featured sake at Wadatsumi is Ine Mankai, which is made across the bay at Mukai Shuzo Sake Brewery. 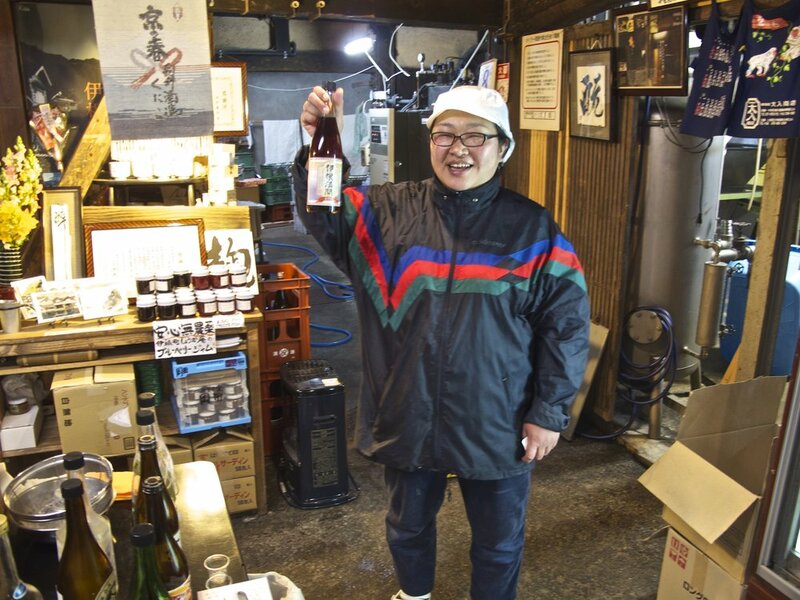 The brewery was founded in 1754, and its current toji, or master brewer, is Kuniko Mukai, who represents the 13th generation of the Mukai family. Ine Mankai is one of several types of interesting new generation sakes that Kuniko makes using heirloom rice and yeast strains. It is a beautiful rose-colored sake made in part from an ancient red strain of rice grown in the area. Ine Mankai is both sweet and acidic, making it a perfect accompaniment for the sweet, rich seafood served at the restaurant. Ine Mankai is recommended to be served chilled. Like all buildings in Ine, Mukai Shuzo Sake Brewery is located at the water's edge, making it easy for local customers to come by boat to buy their sake. Kuniko Mukai is one of only about 20 women master brewers, toji, in Japan.